Get a little extra speed for your network. You might not think a speedy router is necessary after spending a bunch of money upgrading your PC for modern games, and will just go with whatever your ISP gives you. However consider how many devices you've got connected to your network, and the ever increasing bandwidth requirements of online services, and it shouldn't be surprising that your router often comes under heavy load. 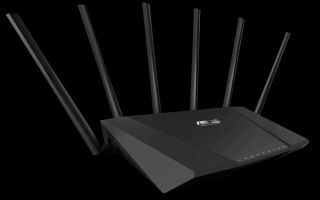 If you want to give your home network a boost, Amazon has just dropped the price of an Asus RT-AC3200 Tri-Band router down to the lowest price its ever been at £145. This is essentially a step or two below what is our favorite high end router for gaming, the Asus AC5300, but opting for this cheaper model will save you over 200 quid. Asus also happens to hold the top spot on our favorite budget router list too. The combined data rate on today's sale is 3200 Mbps, which equates to up to 2600 Mbps over two 5 GHz bands, and up to 600 Mbps on the 2.4 GHz band. Asus claims the range stretches to 400 square meters, and adaptive quality of service technology should prioritize your gaming traffic over other content on the network. You'll also get a handy two USB ports, one 2.0 and one 3.0, and an included USB app that'll let you easily share devices like printers and storage devices over your network. The Asus RT-AC3200 was down around this price at Black Friday, but today it's slightly cheaper, and the price has been fluctuating between £170 and £190 since then, so £145 is a decent chunk off the normal price.